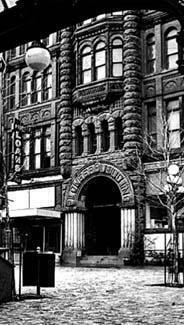 Henry Yesler's Pioneer Building, here at right undergoing restoration in 1974, was Seattle's prestige business address in the decades after its completion in 1890. DURING THE 1960S AND '70S, URBAN RENEWAL SWEPT AMERICA'S CITIES. Proponents of redevelopment pointed to the grim, even dangerous, state of inner-city housing, to the desolation of central business districts, losing ground to suburban shopping centers. But their call, "out with the old, in with the new," threatened wholesale demolition of downtown neighborhoods. Seattle was a prime candidate for renewal. It wasn't as though, developers pointed out, this young city could boast a distinguished architectural history such as Boston's or Philadelphia's. Instead, the hodgepodge of turn-of-the-century brick hotels and worn wooden buildings constituted a civic embarrassment. But Seattle people stubbornly harbored sentimental affection for their scruffy landmarks, hauling out-of-town visitors to the U District's Blue Moon Tavern or Hasty Tasty, the eccentric clutter of Pioneer Square and Belltown, Lake Union's seedy houseboats and industrial ruins, and, above all, the cozy warren of the Pike Place Market. 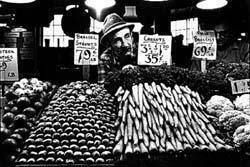 Since August 1907, Seattle cooks shopped the Pike Place Market for good food at low prices. But people came to love the place for its character and characters, too. In the 1970s, vendors continued the tradition of throwing a friendly greeting in with the carrots. Musicians kept the area humming. Photo Credit: Anne Yow / Seattle Times. SHABBY AND LONESOME BY NIGHT, THE MARKET CAME ALIVE IN THE EARLY MORNING as farmers arrived with truckloads of vegetables for the stalls, and shopowners laid out their displays of salmon or cheese or lamb. By noon, the Market pulsed with tourists, hustlers and office-workers on their lunch hours; old men leaned on their canes to chat, vendors snapped bags open and hawked their wares. The Market's rich street life had inspired generations of the city's artists and writers; it was the vital center of Seattle's hometown. 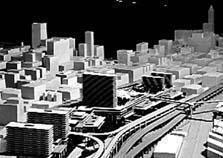 In the 1960s, the powerful Central Association, a group of nearly 400 downtown businessmen, advocated sweeping urban-renewal projects for Seattle's "blighted downtown areas" -- the Market, central waterfront and Pioneer Square. They promised a revitalized city -- "a modern blend of new office buildings, restored historic structures, pedestrian plazas, parking garages, and colorful restaurants" -- that would appeal to free-spending tourists and suburbanites. Some city officials agreed, noting that engineering studies had found 98 out of 108 structures in the Square area to be in "questionable or dilapidated condition." But architect Victor Steinbrueck retorted that "dilapidated" didn't mean "dangerous," and warned that "urban renewal has too often involved wholesale destruction heedless of community values and institutions" in other cities. At left, model by Roger Dudley. LOCAL HISTORIAN AND UNDERGROUND-TOUR PROMOTER BILL SPEIDEL WAS BLUNT. He accused downtown interests of grubbing for federal funds to turn Pioneer Square into "a colony of cheap parking lots." Seattle's chapter of the American Institute of Architects, the Pioneer Square Association, Allied Arts and a broad coalition of clubwomen and activists supported the formation of a protective district to prohibit demolition and place all renovation under careful oversight. In April 1970, the City Council unanimously approved creation of the 40-square-block Pioneer Square Historic District, and restoration of the area's neglected structures began. 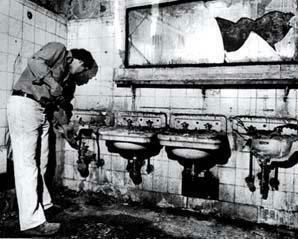 By the 1970s, time and vandals had taken their toll on the once-elegant restroom beneath Pioneer Place, at the Gold Rush city's heart. Photo Credit: Seattle Times. ENTREPRENEURS CHARMED THE PUBLIC WITH INVENTIVE USES of the grand brick and stone interiors, and visitors flocked to the Square's restaurants, clubs and galleries. In the 1960s, developers and downtown business interests had proposed outright demolition of the Pike Place Market. But by 1970, the Pioneer Square debate raised public awareness of what was at stake. A new alliance of businessmen -- including the Desimone family which had long owned the Market buildings -- advocated a facelift, careful structural repairs, and some new construction. Heritage activists, however, no longer trusted any plan proposed by the downtown interests. At City Councilman Wing Luke's urging, the Friends of the Market organized to oppose the new downtown plan. Co-chaired by Steinbrueck and attorney Robert Ashley, the Friends insisted that the best way to preserve the Market was to leave it almost exactly as it was. In November 1971, they put forth a city ballot initiative to create a seven-acre Pike Place Market Historic District, administered by a commission. Mayor Dorm Braman, exasperated, declared the Friends "nitpickers," and pronounced the Market a "decadent, somnolent firetrap." The Seattle Times' editorial writers poked skeptical fun at "self-appointed saviors" and advocated the downtown plan, judging the Market district "far too valuable an asset to be consigned to urban blight and decay, and vast economic waste." In The Times' view, the Friends seemed willing to sacrifice the greatest economic opportunity since Century 21 to their self-righteous inflexibility. The pre-election editorial recommended voting against the Friends of the Market initiative, but the voters overwhelmingly approved historic-district status for the venerable Market. Throughout King County, heritage activists took heart from Seattle's experience. 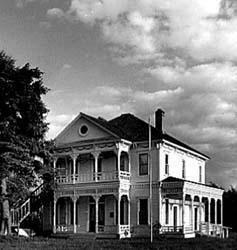 In 1979, the Auburn Arts Council bravely acquired the ramshackle farmhouse locally known as the Neely Mansion. Built in 1894 by Aaron Neely, the home had originally been a showplace, and traces of its former glory could still be seen. In 1983, King County's new Landmarks Commission rewarded local foresight by designating the Neely home as the county's second landmark, hard on the heels of the James Clise summer home at Marymoor Park, in Redmond. Photo Credit: Neely Mansion Assn. THROUGHOUT THE 1970S, THE TIMES REPORTED THE CONSTRUCTION OF ONE OFFICE TOWER AFTER ANOTHER as shafts of steel and glass dramatically transformed the cityscape. The Market and the Square maintained the city's human scale -- benches and trees, nooks and crannies, alleys and arches; throughout the county, homesteads, shops and mines were set aside to mark the changing ways of life. Historic preservation proved to be not just about saving old buildings, but protecting a unique character, a local heritage.